Nikkalite® Crystal Grade, the preferred material of choice for Welsh Police Forces. PVL UK Ltd; one of the leading suppliers of conspicuity materials to the emergency services and one of Rennicks preferred converters, won the first contract to supply South Wales, Dyfed-Powys and Gwent Police some 4 years ago, at which point they all changed to using Nikkalite®. Two years ago, North Wales Police joined the contract and also started to deploy the same materials having seen the results in the other Welsh forces. So when PVL successfully won a new contract to provide livery kits to the new All-Wales contract; Nikkalite® was already proving to be a well-respected brand which they felt confident to continue using for the new contract. This highly reflective micro prismatic film has been specifically developed for markings on emergency service vehicles such as Police, Fire and Ambulances where clear visibility and durability is a must. It is well known for providing high visibility and reflectivity in both day and night conditions but also for its flexible, conformable properties and handling of complex curves and shapes that are becoming increasingly common on vehicles. 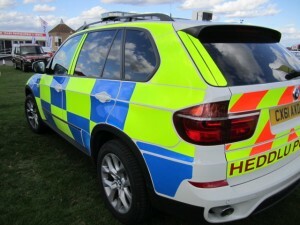 The Welsh Police fleet managers are already starting to see the difference with a highly visible fleet and with the new AdvantEdge edge seal finish the high visibility markings ensure their vehicles can be seen whatever the conditions. The Welsh Police Forces remain confident of the support and partnership provided by Rennicks and PVL for their livery contract.